I love snacking. Finger food? Appetizers? Bring them on. In fact, I so enjoy these little meals that I’d pick portable foods over five-course meals nine times out of 10. OK, maybe seven. This kind of love has led me to engage in some strange behavior. Like the spontaneous purchase of a rice cooker a few weeks ago (in hopes of being able to craft the homemade sticky rice cakes I’ve been ogling from this book for cyclists). I normally refuse to let single-use appliances into my life, but this one doubles as a slow cooker. That’s got to count for something. I started to wonder what all you other busy triathletes/runners/fitness addicts keep kicking around for sudden hunger attacks, and thought I’d get the ball rolling by offering a peek into my secret stash. A little embarrassing (where are the kale chips, hippie? ), and by no means my favorites, these mainstays get me through the day when the going gets tough. It’s time to fess up, people: I want to see your drawers. 10- Bear & Wolf Wild Alaskan canned salmon, from Costco (great mixed with a microwaved sweet potato and salad dressing). Thankfully, this way of eating works well with my own version of the daily grind, which lands me about a 20-minute walk from anything decent to eat for lunch (ie: the new Del Mar Whole Foods). Having to walk under the freeway to get there is not ideal, however; plus I’m still a frugal hippie who only buys lunch about once a month. If I bike commute it’s even worse—I’ve yet to find a jersey that fits a Tupperware of salad. The solution? A well-stocked snack drawer. Though dark chocolate-covered pretzels have snuck in on occasion, I try to keep it full of healthy options. It comes in handy on days I was too lazy to pack lunch the night before, and am too busy with work to even think about leaving the office. With the frozen Amy’s burritos I keep in the office freezer, I could probably survive here for two weeks. Office kitchens—if it’s fair to call them that—are right up there with morgues and faux Irish pubs as the most depressing places to be at noon on a weekday. They’re usually windowless, filthy, and reeking of stale, microwaved cheese. […] Nothing worth eating has ever come out of an office kitchen. It’s either frozen dinners or last night’s leftovers, entombed in a plastic container and revivified in the microwave. 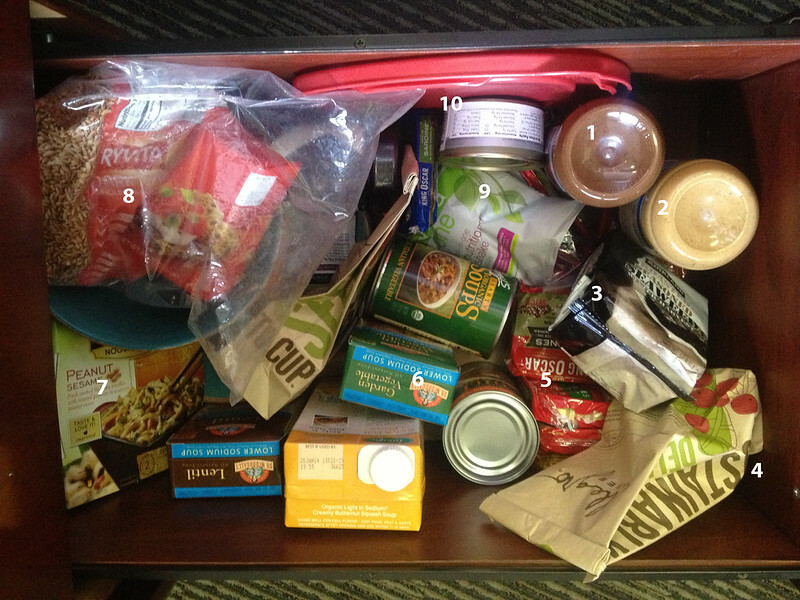 What’s in your office snack drawer? What are some of your favorite go-to mini meals? I have yet to use my rice cooker for rice. I use it to make batches of quinoa with chicken stock. I chop up tomato, cucumber, radishes, onion and cilantro and add it to the cooled quinoa and keep that in the fridge. I’ll add it (and half a can of salmon) to a bed of spinach or Spring salad mixture in the morning and add salad dressing just before eating at lunch. Good proteins, pretty filing and since most of the salad fixings are already prepared and in the quinoa, it takes just a minute or two to throw into a container in the morning. That’s my go-to healthy lunch. Office snack: oiled, salted, seaweed from Costco. Love seeing your drawers! Mine has similar items, although I also have natural dried mangoes and my own roasted al India, and Suzies Corn, Quinoa and Flax thins have become one of my new favs! Thanks for sharing – I hadn’t thought of low sodium soups or canned fish as emergency snacks, good idea. I don’t stock up much at the office because I tend to eat ALL of whatever is there, but I’ll need to do this when I start IM training. Oh, and the rice cooker is well worth it, esp for Allen Lim recipes; my 2nd fave appliance behind the vitamix. Brittany, that’s the battle. If I keep roasted almonds or chocolate or chips in my desk, they won’t be around for long. It’s hard to strike a balance between keeping enough on hand for those busy days, and opening the door to piggy-dom. What IM are you registered for? Yes! I’m registered for IMTX… I know, it’ll be a scorcher! I usually pack my snacks on a daily basis (fresh fruit and whatnot) and try to keep a Kind bar or two around, but at the end of the school year, I started to keep these Trader Joe’s “Almondina” cookies around which were great with some fruit and/or string cheese! I often use snack time as a reason to take a walk and leave campus, so I’m okay if I don’t instantly have something on hand, and a juice/smoothie place is an easy 5-minute walk. One of the odd “perks” of our office kitchen is that it always stocked with milk. So I always have a couple of boxes of cereal stashed at my desk. For the sweet tooth, I keep something a bit more junk-foody around (Raisin Bran – you can SEE the sugar! What a treat). For something healthier, I usually have some sort of Kashi around. Other treats include pretzels and natural peanut butter (pair ’em together), and raw almonds. In the fridge at work, there’s always cheese sticks, Greek yogurt and V8.